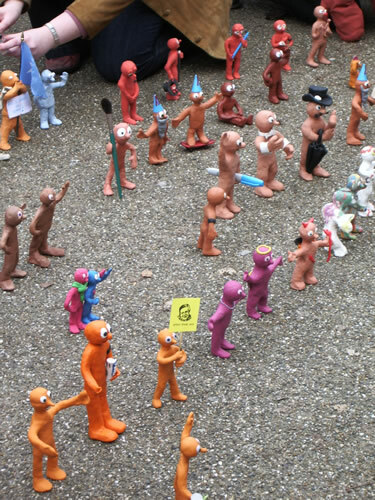 A flash mob of tiny Plasticine figures honoured the memory of one of Britain's favourite television presenters. Nearly 200 of the small orange models drew an even larger crowd of human onlookers at the Tate Modern gallery on London's South Bank. Each one was formed in the shape of children's television favourite Morph. 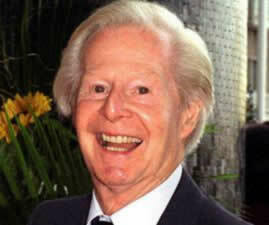 The unusual event has been organised on social networking website Facebook by a group of friends who wanted to remember Tony Hart, who died earlier this year. Mr Hart's constant companion on his long-running television show inspired group members to some unusual interpretations of the well-known figure. One Morph was wearing a bikini, another sported wings and a third was dressed as a reggae rap star. Members of Mr Hart's family came to see the rows upon rows of little Morphs and judge a competition on the best effort. Laura Kerry, a 31-year-old arts manager from Walthamstow scooped the title. "I only spent four hours making him," she said. "I heard about it and I was just really moved and felt we had to be part of it." Her Morph was a traditional interpretation, looking uncannily like the original character and holding a pink carnation in his outstretched hand. Mr Hart's daughter Carolyn Williams judged the competition for the Best Morph. She said: "I've been completely bowled over suddenly to discover that there are hundreds of people with whom I share my father and who probably love him almost as much as I do. He would be absolutely thrilled. He would have thought: 'You're all completely mad' but he would have been very touched."